If you live in the area of 26 1/2 and H Roads, a big change is coming to your neighborhood, and it may not be a change you’re going to like. 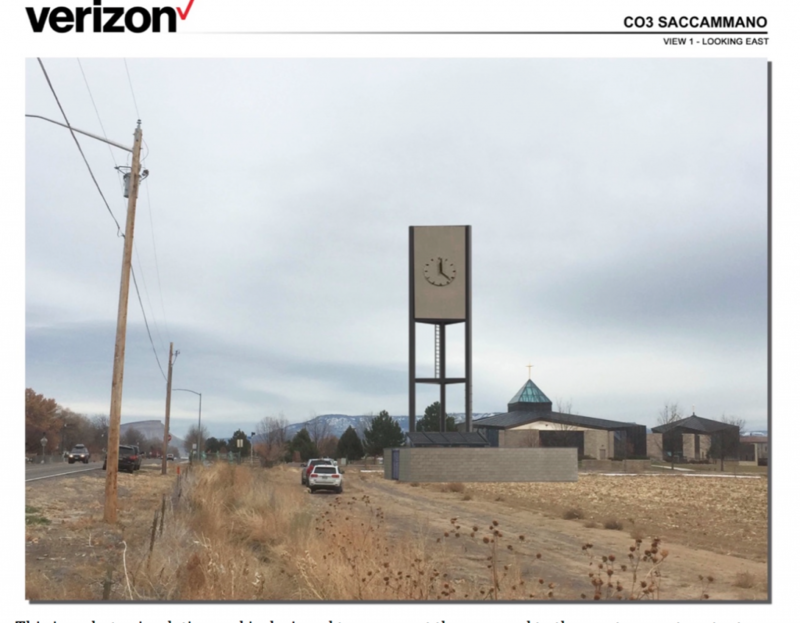 City planners call it a “stealth” cell phone tower, meaning Verizon plans to disguise it as something else. The chosen design will make it look like a clock tower set in a corn field. There is no information about whether the clock will actually work or keep correct time. 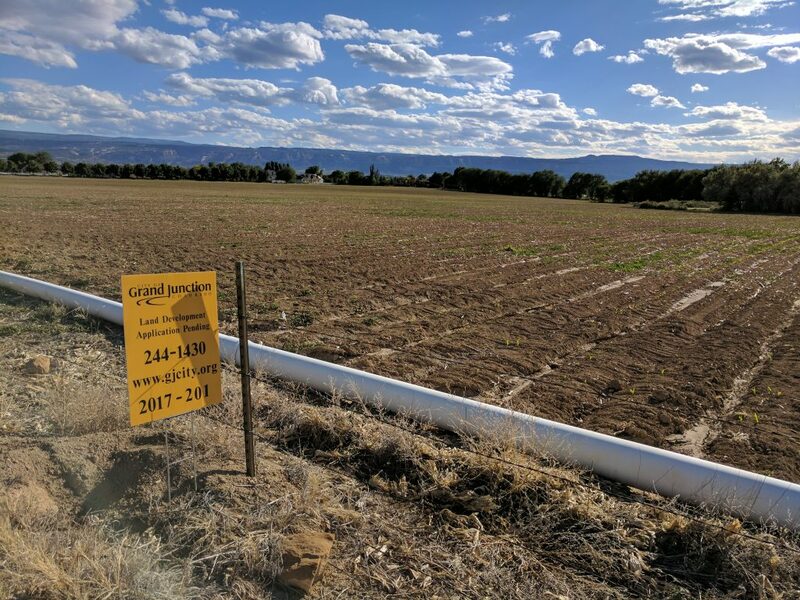 The only signs of the impending cell tower installation are two small, yellow City of Grand Junction development signs stuck in the dirt, one along 26 1/2 Road and one along H Road. The signs don’t say anything about the proposal, but only display the phone number of the city planning department: 244-1430. There are not going to be any public hearings or public comment taken on the cell tower installation, the planning department says, making it sound like it’s a foregone conclusion that the City will agree to it. While some people are concerned about the electromagnetic fields cell phone towers generate, the towers also pose well-established hazards, the most common of which are fires, collapse, explosion and loss of surrounding property values. Cell towers require backup power systems which are typically contained inside the base. These systems could be diesel generators or batteries, requiring significant amounts of hazardous materials like diesel fuel to be stored in the base. This makes the towers particularly hazardous when located near schools or daycare centers. This newly-proposed tower will be across the street from the Holy Family School. In addition to fires, other hazards posed by cell phone towers include collapse from construction defects, worker accidents and deaths, increased criminal activity, falling ice and debris, and suicides from towers. Crime on cell phone towers is also a growing phenomenon. In particular, the theft of tower batteries has become a growing a problem in recent years. Cell phone tower batteries have become “the new copper” when it comes to hot items for theft. Googling “cell phone tower battery theft” shows many such crimes. In May, 2015, authorities caught a man in Pennsylvania who was suspected of stealing over 4,000 cell tower batteries from more than 500 towers in four states in the northeast. The suspect was a tower technician subcontracted by Sprint and Verizon. He sold the stolen batteries to a recycler in Philadelphia for $30 apiece, netting $122,000. More recently, in April, 2017 a thief was caught after stealing 64 batteries weighing approximately 40 pounds each from a cell tower in New Jersey. A March, 2014 survey by the National Institute for Science, Law & Public Policy found that cell towers negatively impact interest in real estate properties. 94% of the survey’s respondents said a nearby cell tower or group of antennas would negatively impact their interest in a property, or the price they would be willing to pay for it. 79% said under no circumstances would they ever purchase or rent a property within a few blocks of a cell tower. 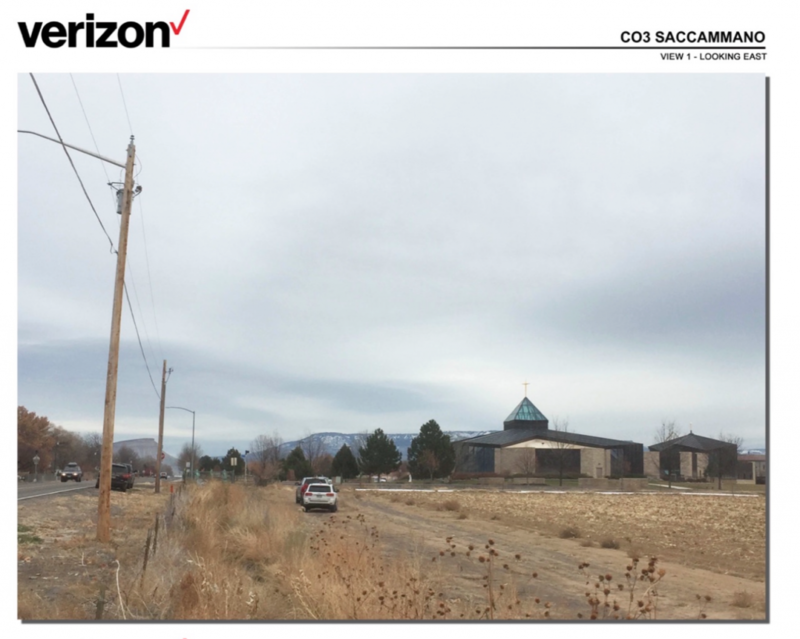 City Planner Dave Thornton says there will be no public hearings on the Saccomano Park cell phone tower because it is “part of the city’s master plan.” This infers that area residents have no choice in the construction of this tower. But this doesn’t mean you don’t have rights and can’t have any input into the proposal. You have the right to fight against losses to your property value resulting from the installation of a cell tower in close proximity. You have the right to protect yourself, your family and neighbors against the dangers of cell tower fires and collapse, which occurs more often than most people realize. You have the right to fight against having a cell tower negatively affect the character or aesthetics of your neighborhood, particularly if you bought your property on the implied promise that “Saccomano Park” was eventually going to be developed into an actual neighborhood park and not an industrial site. According to attorneys who specialize in fighting cell phone towers, you also have a right under the First Amendment to the U.S. Constitution to be heard in opposition to cell tower applications. The Constitution also guarantees your right to petition local government for the redress of grievances. By exercising these rights, people across the U.S. have not only defeated carrier’s efforts to install one or more cell towers near their homes or businesses, but have even managed to force a carrier to tear down a cell tower that was already near completion. There are just under a quarter million cell phone towers in the United States (215,000 according to reliable research). Even if the examples above were just *half* of the occurrences of cell tower fires, that still puts you at roughly 0.016% likelihood of any one tower catching on fire. I’d rather my neighbor be able to use their cell phone to call 911 when I get struck by lightning than live in fear that said tower might catch fire… And for those that say you can just use a landline, it’s becoming more and more common place for people to not have land-lines at all. This is one of many that have been erected on private land under the radar of public notice/hearing and escaping permit processes often, otherwise required. I will share, a have several friend that live just west and just south of the “Park” what BS…one couple bought their house several years ago with the promise of a park…now toxic cell tower!!!. I guess I will get to see it from my front window, so much for my view of the Grand Mesa! This is small potatoes compared to the 300+ high density home subdivision that will be happening further north on 26 1/2. At least they are providing some sort of disguise for the tower! You must be reading my mind. I distinctly remember feeling the exact same way back when the biggest grocery store in Grand Junction was a place named “Huckalbees” or was it Waddels”? Back when one of the biggest things in my life was a trip to Cole Scotts for a Big Chief soda on a hot afternoon. When there was no North Ave. And back when the Clifton Fire Dept had a reputation of being worse than the fire. Fandangos out by Mack on a Saturday night. And knowing just about everybody you met by their first name. They told me back then, it was called progress. Well, how is it for you now? Progressive enough? Well, I know what I would do if I suffered from cell phone tower phobia, I’d claim it was all a conspiracy by Donald Trump. And I’d go put a home made sign at the sight advertising the future home of the doomsday clock tower. That ought to get their attention. Now about that Trump derangement syndrome……. I’m glad they are adding the tower. I’m so tired of dropped phone calls. I get better cell phone reception on the beach in Hawaii than I do in Paradise Hills, Grand Junction. Subdivision. I welcome the tower. I had no idea that cell phone towers were so dangerous. Do you know why Verizon thinks it is so important to have one in this location? We are pretty addicted to cell phones, as a society. How do we make sure people have safe and reliable access? Most people are unaware of the dangers cell phone towers pose. Admittedly, there is a connectivity “hole” in this area of north 7th Street (26 1/2 Road) that could use remediating. This tower will not only negatively affect the local public safety and property values, but it will look ridiculous. I also think it is unfair to area homeowners for the city to turn its designated parklands into industrial sites. You should see “Horizon Park.” Right now it is being used as storage for mountains of gravel. If you bought homes near these sites thinking someday you’d live near a beautiful developed neighborhood park, you’re in for a nasty surprise.